Paul Zanker, in his Roman Portraits: Sculptures in Stone and Bronze in the Collection of The Metropolitan Museum of Art (2016) no. 3, identifies the figure as an orator and dates it to c. 50–30 BC. Zanker observes that the folds of the drapery contain "many traces of soil" suggesting to him that the figure comes from "an excavation". The so-called excavation is not likely to have been a scientific one, or the statue would have been known. One also wonders why a statue that has been out of the ground for so long is presented as if it is fresh out of the ground. There is no mention of any analysis of the soil that could perhaps have given an indication of the findspot. Zanker suggests that the statue "presumably" was found in "western Turkey or neighbouring Syria". Does Zanker reject the MMA's view that the statue was (said to have been) derived from Syria? 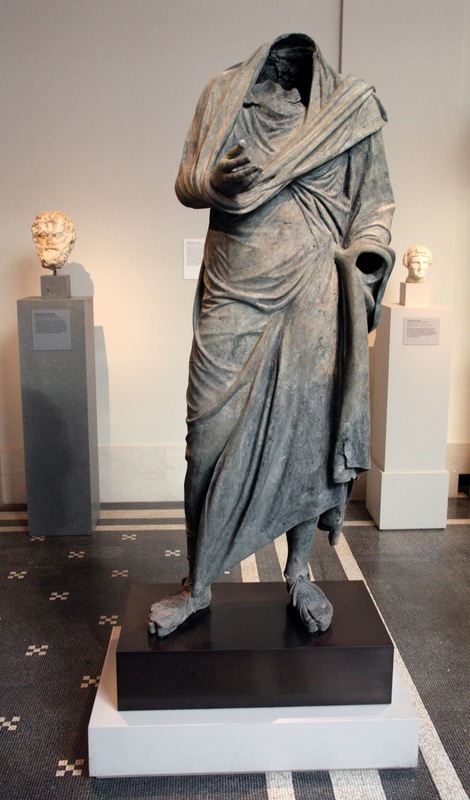 The statue was purchased from Phoenix Ancient Art in 2001, the same year that it was donated (anonymously) to the MMA. The head of Drusus Minor acquired by the Cleveland Museum of Art, and now returned to Italy after it was shown to have been removed from an archaeological store; it had been provided with a history that had placed it in Algeria in the 19th century. The Leutwitz Apollo acquired by the Cleveland Museum of Art; the bronze statue had been provided with a history that had placed it in Leutwitz before the Second World War. A discussion of the history can be found here. The Egyptian mummy case excavated (and published) at Saqqara in 1952, and was acquired by the St Louis Art Museum; it was provided with a history that placed it in a dealer's gallery in Brussels. The full history can be found here. It is also important to remember the Etruscan architectural terracotta that was returned to Italy from the Princeton University Art Museum. It is claimed both by the MMA's online catalogue entry and in Zanker, that the statue was "Reported to be the property of A. Weber of Eulenbruch, near Cologne, Germany, from the late 1970s". The word reported suggests that there is no actual authenticated evidence that it did indeed come from Herr Weber, otherwise the entry would have said something like this, "Formerly the property of ...". The MMA felt that it could make the further acquisition in 2010 as it had received "part" of the statue as a gift in 2001. (See the AAMD Guidelines for 2008.) The exception made was: "The work was accepted as a partial gift in 2001 and has been exhibited publicly since 2007. Such over life-size bronze statues are extremely rare, especially ones of the quality of this piece. It represents a major class of Hellenistic honorific statuary not otherwise represented in the Museum’s collection." The history of this bronze statue in the period before 2001 appears to be unconfirmed. Should the MMA reveal the nature of its due diligence process prior to the acquisition of the bronze? Would it be unusual for the Bubon sequence of portrait statues?